Mahavir, also known as Vardhamāna, was the 24th and the last Tirthankara of Jainism. He is revered by the Jains for his spiritual and philosophical contributions to Jainism. Born in the 6th C BC, Mahavir was a follower of ahimsa (non-violence), satya (truth), asteya (honesty), brahmacharya (chastity) and aparigraha (non-attachment), the principles that went on to sculpt Jainism as we know it today. To commemorate the birth of the great saint, Mahavir Jayanti is held every year on the 13th day of the bright half of the moon in Chaitra month. Much of what we know about the 24th Tirthankara is from Jain Text. On Mahavir Jayanti 2019, let’s learn some of the most interesting facts about Mahavir. Happy Mahavir Jayanti 2019 Wishes: WhatsApp Stickers, GIF Image Greetings, SMS, Jain Festival Photos & Facebook Quotes to Share on Mahavir Janma Kalyanak. Mahavir was born in the royal Kshatriya family of the Ikshvaku dynasty. He was the son of King Siddhartha of Kundagrama and Queen Trishala, who had a series of 16 dreams about her unborn son. These auspicious dreams signified that her son was going to change the world. Before Mahavir’s birth, astrologers predicted the child will be no doubt destined for greatness. But he may either be a Chakravartin (Emperor) or Tirthankara (spiritual guide). True to their predictions, Mahavir grew up to become the 24th Tirthankara. 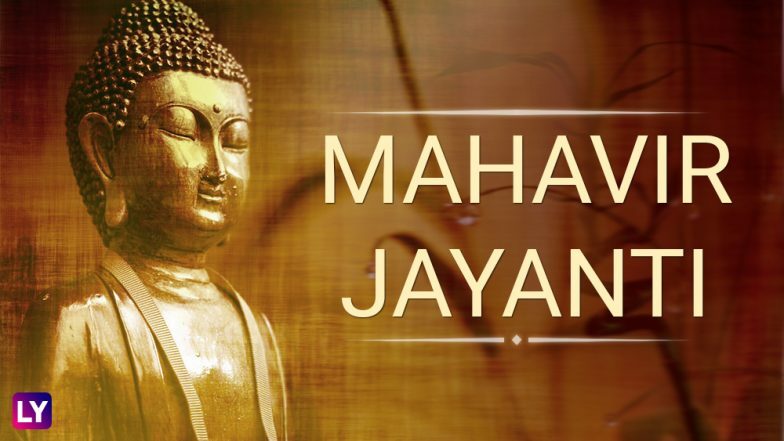 Mahavir Jayanti 2019 Date and Significance: History and Celebrations Associated With Major Jain Festival of Mahaveer Janma Kalyanak. The king of devas Lord Indra himself celebrated his birth. It is said that the celestial lord rode the child to Mount Sumeru on Airawat, his white elephant and performed his abhishek. The birthplace of Mahavir is called Ahalya Bhumi in Vaishali. For hundreds of years, the land has not been tilled by the family that owns it. According to Jain mythology, Mahavira had undergone many rebirths in the past. The 28th time, he was born to the king and queen of Kundagram to fulfil his destiny. In his previous births, he had been a lion, a deva and even a resident of hell. Mahavir Jayanti 2019: Information and Facts About The 24th Tirthankara of Jains. Despite being 10 feet tall, Mahavira was dwarfed by the other Tirthankaras before him, according to the Aupapatika Sutra. Aristanemi the 22nd Tirthankara was said to be 60 feet in height and lived for 1,000 years. At the age of 30, Mahavir his family, possessions and other trappings of worldly life to become an ascetic. He discarded his clothes and underwent rigorous fasts to attain spiritual awakening. His intense pursuit of spirituality bore fruits as he became omniscient after 12 years of penance. After attaining supreme knowledge, he travelled across the country, preaching what he learnt. Mahavir’s life resembled Gautama Buddha’s in many ways. Both were princes who renounced their worldly life. And both attained enlightenment. They denied God and rejected the vedas. Mahavir and Buddha endorsed the idea of rebirth and karma. Many believed they were one and the same. Much of what we know about Mahavira is through Jain texts. For centuries, his teachings and philosophy have guided Jains to follow a life free of dishonesty, violence and attachment. On Mahavir Jayanti, Jains across the world pay obeisance to the 24th Tirthankara who has been shaping their ethos.